Alii peritissimi Trinitati superbenedictae triangulum trium aequalium et rectorum angulorum compararunt. Setting aside any mathematical problems with his geometry, I'm curious about the origin of this image. It would seem to be related to other geometric metaphors for God, such as "an infinite line" or "a circle whose centre is everywhere and whose circumference is nowhere". But I have not heard this one before. Who came up with this idea and what did they mean by it? 1. Translation by Jasper Hopkins (1985) and appearing in his Complete Philosophical and Theological Treatises of Nicholas of Cusa, Arthur J. Banning Press, 2001. Parallel texts from Cusanus-Portal. 2. It's not clear why he thinks they must be right angles. In some sense it would be more consistent with his reasoning for them all to be 180 degrees, which is one reason to believe that in this case, he's talking about someone else's idea. The likely1 source for this image is Nicholas's mentor, Heymeric de Campo (1395-1460), who wrote a treatise on a geometric figure he called the "seal of eternity" 2. 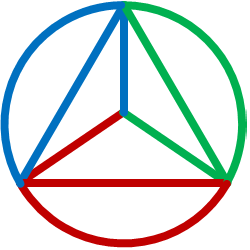 This is related to the well-known image of the "shield of faith", a triangular diagram representing the persons of the Trinity. Unlike the shield, Heymeric's picture is a regular geometric picture; the various lines are coloured; and the interpretation is more complex. Note that the central point does not represent God - the whole picture is "an image of the divine government" (figura thearchica). The first side of the triangle, with the portion of the circle of which it is the chord, and the dependent line from its angle of origin, is to be blue in colour. The last one follows Jerome's interpretation of the Hebrew word בַּשָּׁלִ֖שׁ (Strong's 7991), which has various meanings related to the number three; depending on context, it may refer to an officer "of the third rank", a triangular musical instrument such as a nabla/nevel, or, as here, a unit of measure of some kind. The three colours stand for celestial substance (blue), life (green), and flame (red), corresponding to the Father, Son, and Holy Spirit. It would be tempting to imagine some knowledge of the RGB colour system, but Heymeric is writing long before Newton, let alone Young and Helmholtz. The bulk of Heymeric's treatise consists of a point-by-point explication of how this figure represents the Trinitarian doctrine of Thomas Aquinas, as described in Book 1 of his Summa contra Gentiles. For example, the concept "God is blessed and his blessedness exceeds all other blessedness" (SCG 1.100-102) is expressed by the fact that the figure may be geometrically expanded to any desired size (para. 66, f. 84v); and "Creatures may carry a resemblance to God" (SCG 1.29) by the radii, representing causality, that drop down like rays of light (para. 45, f. 83r). In particular, the orthogonality of these lines to the circle is used almost as a pun, for the "rectitude" and "rightness" of God, whenever these ideas arise in the comparison. In the adaptation by Nicholas of Cusa, the diagram is "really" meant to be infinite, so that (according to his mathematics) the component parts merge into an indistinguishable unity. This mirrors the continual assertion of Heymeric that the figure is only a metaphor, suitable to our senses and imagination, of something transcendental; and both authors are known for their insistence on the fallibility of human reasoning. 1. Paul Wilpert. De docta ignorantia / Die belehrte Unwissenheit, volume 1. Hamburg: Felix Meiner, 1964 (1st ed.). Note at 15a.120.n34. 2. Tractatus de sigillo eternitatis omnium arcium et scienciarum exemplari a magistro Heymerico de Campo Basilee tempore concilii editus. In Cusanusstift MS 106, f. 77r - 85r. Written between 1432 and 1435. The Latin quotations in this answer are reproduced from Heymericus de Campo Opera Selecta, volume 1, Ruedi Imbach and Pascal Ladner (eds. ), Univ. Freiburg Schweiz, 2001. The English translation is my own fault.